We have just released an update to CodeTwo Exchange Rules PRO, our email flow, content and signature and manager for Microsoft Exchange. 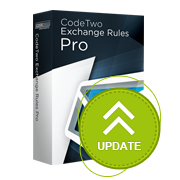 The new version is free for CodeTwo Exchange Rules PRO 2.x license owners (install on top of your current version). It includes several minor bug fixes and 5 new features. For most Exchange veterans the title probably says it all. But in case anyone is still confused – starting with version 2.2.1, CodeTwo Exchange Rules PRO allows for applying several actions to encrypted and digitally signed messages either directly or by wrapping them in an envelope of a new email. Thanks to adding the new Secure message type criteria, our application now also allows for excluding encrypted and digitally signed emails from processing, as well as doing the opposite: creating dedicated rules for these special message types. One scenario where the new feature may come in useful is stamping encrypted emails with disclaimers. CodeTwo Exchange Rules PRO can now perform actions such as blocking, adding recipients or modifying the subject directly on secure messages. However, when it comes to actions such as adding signatures, we took a page from Microsoft’s book and decided to insert the secure message as an attachment of a new email and apply the action to the new email. The body of the new email can be edited via CodeTwo Exchange Rules PRO’s settings. This way your encrypted or digitally signed message remains untouched, and at the same time, all the information you wanted to convey via the email signature, reaches the recipient. Additionally, if necessary, you can exclude encrypted messages from being processed by a given rule by adding the Rule Exception – Secure message type is encrypted. Doesn’t Exchange Server already have this? Reply with fully customizable HTML auto-responders. You can test CodeTwo Exchange Rules PRO for 30 days at no cost (credit card not required). Just use the below link to download the setup file, install the software as per these instructions and see how it performs live. Remember: during the trial period you’re entitled to full technical support!